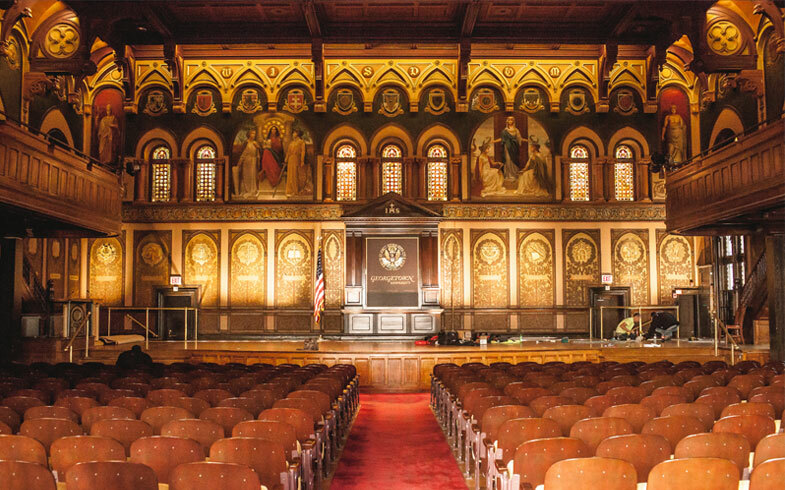 Gaston Hall on Georgetown University’s campus is an ornate auditorium that was built in 1901. It has hosted dignitaries, convocations, honorary degree ceremonies, lectures, musical performances, and theater. Former President Bill Clinton, former Secretary of State Hillary Clinton, former Prime Minister of Great Britain and Northern Ireland Tony Blair, Italian Prime Minister Matteo Renzi, and President Barack Obama have spoken there. Renovations were planned when the 107- year old stage floor was found to be structurally unsound. During the process, Aarow Electrical Solutions of Hughesville, MD installed stage lights. Now, guests can walk on a new hardwood floor, with in-floor stage lighting and decorative floor boxes that house power and audio-visual wires. Aarow also integrated a WiFi system throughout the hall. The renovation schedule was critically tight—a two-month project completed in four weeks. As a result, the team needed to make substitutions to the original design. For example, the original specs called for lights that the manufacturer could not produce in time. To meet the deadline, Aarow researched alternative options, found other lights with the dimming capabilities the university wanted, and sought buy-in under a tight time frame, ensuring that everyone understood and agreed on the capabilities of the replacement lights. They used a similar process for the decorative floor boxes. Another project challenge was especially memorable. The electricity had to be installed from below the steel beams, in a very tight space, and the electricians crawled on their stomachs to hook up the wiring.